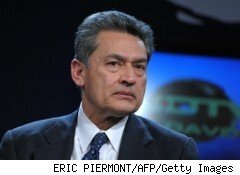 When the Securities and Exchange Commission on Tuesday filed insider-trading charges against Rajat Gupta, former head of consulting firm McKinsey & Co. and former Goldman Sachs (GS) board member, it came as a shock to many. After all, McKinsey is arguably the world's most prestigious consulting firm, and it has built a stellar reputation for trustworthiness. And Gupta likewise had huge clout. But the allegations, if they turn out to be true, aren't as unfathomable as they might seem at first. Perhaps surprisingly, the pay available to the cream-of-the-crop businessmen and businesswomen hired by elite firms like McKinsey and Goldman Sachs pales in comparison to the riches that await the manager of a huge hedge fund. The top 25 hedge-fund managers earned an average of $1 billion each in 2009. It's likely that Raj Gupta, who ran McKinsey from 1994 to 2003, made millions -- not billions -- of dollars a year. And Gupta's not the first McKinsey partner to be accused of insider trading. In October, director Anil Kumar was charged with leaking information about Advanced Micro Devices's (AMD) 2006 purchase of ATI to Raj Rajaratnam, founder of the $3.7 billion Galleon Group hedge fund. In January, Kumar pleaded guilty to the charges and admitted to earning $2.6 million by illegally providing the information. The SEC claims that Galleon made a total of $17 million from Gupta's leaks about Goldman Sachs and an additional $570,000 from insider information from Gupta about a Proctor & Gamble board meeting in 2009, Fortunereports. Gupta resigned as a Proctor & Gamble board member Tuesday. $13.3 million profit from earnings tip: Gupta supposedly told Rajaratnam -- more than a week before Goldman posted earnings in June 2008 -- that Goldman would be reporting better-than-expected earnings. Galleon made a $7 million profit selling options it bought before the news came out, and an additional $6.6 million from selling Goldman shares. $3 million loss averted: In December 2008, Goldman reported results that were much worse than expected. The SEC claims that Gupta had tipped off Rajaratnam to this in October, giving Rajaratnam time to sell 100,000 Goldman shares and avert the loss he would have incurred when Goldman stock fell $24 from its October price on the news. $900,000 on news of Buffett's investment. In September 2008, Gupta allegedly called Rajaratnam seconds after a Goldman board meeting ended to relay the news of Buffett's investment. Galleon made a $900,000 profit from the sale of 295,000 shares before that news became public. The charges leave plenty of people wondering why someone like Gupta would risk his position and reputation -- not to mention his freedom -- to give a hedge-fund manager insider information. Of course, the charges may not be true. But if they are, here's one guess why someone might be tempted: The difference between being in the top 0.1% and the top 0.001% of earners could lead to seething jealousy that suspends a person's sense of right and wrong. And that begs the question: Can we expect more of these insider-trading cases to come? The case of Kumar, and also -- if he's convicted -- of Gupta, could well be isolated instances. But the fear is that Gupta's elevated status also could indicate more widespread insider trading, which some industry watchers already believe exists. If that turns out to be the case, we can expect to see McKinsey's business implode pretty quickly. After all, companies are unlikely to trust their futures to consultants who they believe might trade those secrets for personal gain.